Dr. Daron Davis ’07 and Josh Devin ’07 and their girlfriends soaked up the sunshine at the October Dallas Country Club brunch. 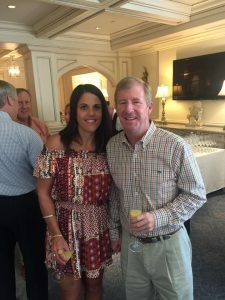 Alumni met for brunch at the Dallas Country Club on Sunday October 15th following the Red River Rivalry game to mourn a Longhorn loss but to also celebrate exciting new ventures for Texas Pike. Approximately 50 guests gathered, with alums ranging from recent grads Jacques Babel and Matt Hoover to early 2000s Jeremy Camp to a mid-1960s initiate George Neill. Guests enjoyed mixing and mingling, and received an update on the Centennial Campaign for the new Pike House over brunch from House campaign finance leadership team members Stuart Ford, Russ Keene, Tom Peel, Tucker Graves and Steve Tiemann. Amongst alums attending the brunch were David Bartus, Meade Bauer, Jeff Meador, Steve Bruneman, Carleton Spears, and Marcus Fettinger. 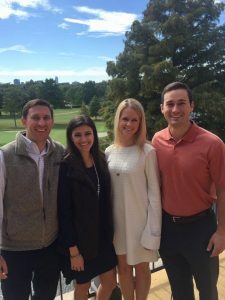 The Pike Alumni Board intends to host this TX/OU Weekend Brunch annually in the future. Join us next year! As he always does, Tucker Graves ‘78, and friend, brought good cheer to the alumni brunch. 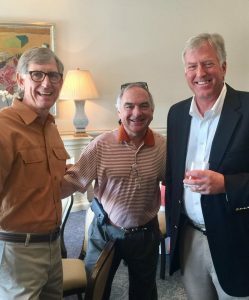 Tom Peel ‘73, Stuart Ford ‘76 and Steve Tiemann ‘77 serve on the new Pike house campaign committee.